Nor is Samsung the only smart TV manufacturer collecting this type of data. In Samsung’s case, at least, users have the option to disable the collection. That's not always the case. In November 2013, the owner of a smart TV made by LG Electronics discovered that the device was collecting information about his viewing habits, even when the “collection of watching info” feature was turned off. Worse, the TV also sent back to LG’s servers the names of files stored on external media devices and even network shares. These increasingly aggressive data collection practices by TV manufacturers, which hope to make some advertising revenue on the side—the LG policy says the data can be used for personalized advertising—raise the question of whether smart TVs are really worth the privacy sacrifice, especially when alternatives are available. 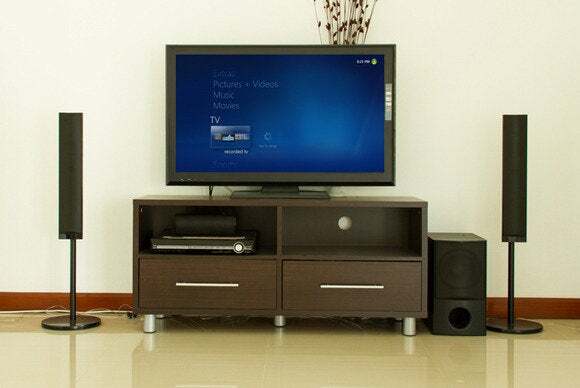 Many smart TVs provide less functionality than dedicated home theater PCs (HTPCs) connected to regular TVs. And HTPCs these days are no longer expensive, bulky or power hungry (though there are certainly pricey exceptions for home theater buffs). You can build a gorgeous, fully functional home theater PC for under $500—and it'll even blend right into your home entertainment cabinet. There are even numerous HTPC front-ends with lean-back interfaces designed specifically to make it easier to couch surf with your PC. Don't feel like spending hundreds on a full-fledged PC? A $35, credit card-sized Raspberry Pi can easily be turned into an HTPC by installing OpenELEC, a lightweight Linux distribution designed specifically to turn a computer into a media center. The original $35 Raspberry Pi model B.
OpenELEC is built around the popular Kodi (formerly XMBC) open-source home theater software, which supports a wide variety of media formats, streaming and file sharing protocols—often more than what the media players included in smart TV firmware can handle. It’s also extensible and has a large collection of add-ons that provide anything from weather information, to Web browsing, YouTube viewing and even voice control through mobile phones. The recent Raspberry Pi 2 update offers six times the performance of the original for the same $35 price, but if the mini-PC is still not powerful enough for your needs, there are other small alternatives. For example, currently sold for $120, the 2-by-2 inch CuBoxTV packs a quad core ARMv7 CPU, 1GB RAM, a 3D graphics chip, HDMI, USB, Gigabit ethernet, eSATA and optical audio ports along with an InfraRed receiver for use with TV remote controls. Users can get SD memory cards preloaded with OpenELEC or Android that just need to be plugged in. Granted, setting up and configuring an HTPC can take more work than simply buying a smart TV and turning it on. However, given TV manufacturers’ increased appetite for user data, HTPCs, especially those based on open source software, are a safer choice for those who value their privacy.